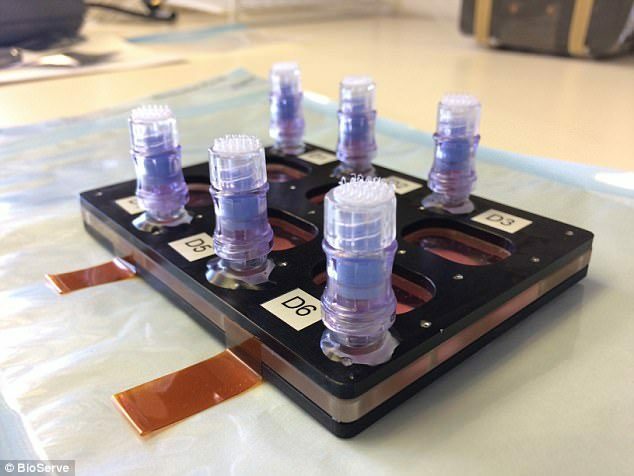 3D Bioprinting in Space- Curing Cancer? Bioprinting is an Earth-based technique of using magnetic forces to handle cell cultures. Researchers add gold atoms to cell cultures, and the atoms bind strongly to the membrane of the cells, which then make it possible to manipulate them with magnets. In a new project called the Magnetic 3D Cell Culturing Investigation, researchers are growing lung cancer cells using this method to better handle cells aboard the International Space Station, where gravity is limited and cells are harder to manipulate. Researchers are set to grow cancer cells aboard the International Space Station to advance cancer research. Cancer cells grow as a 3D structure in the human body – in an almost spherical shape – but when researchers try to grow cancer cells in test tubes or on petri dishes, they grow in layers. In space, cells grow in 3D, but microgravity can make it difficult to keep them in place, so researchers are growing lung cancer cells with gold to control them using magnets. A wide variety of research relies on growing cells in culture on Earth, but handling these cells is challenging. However, handling cell cultures in microgravity in space poses its own set of challenges, and with ongoing cell investigations aboard the ISS, optimizing handling techniques is critical. Growing cells in space is important for cancer research, as cancer cells grow in three dimensions in space, as they do in the human body. On Earth, cancer cell cultures grown on petri dishes or test tubes grow in two-dimensional layers. ‘Although it’s the same material, just the fact that it has a different shape changes a lot of things,’ says Dr Luis Zea, research associate at BioServe Space Technologies, University of Colorado, Boulder and a co-investigator on the project. ‘If you don’t have the right shape, then you can’t really conduct the test as accurately as you would like to. However, because growing cells in microgravity poses challenges, researchers are set to use a technique involving magnets to better handle cells aboard the International Space Station.